This book is a major breakthrough in the field of conflict resolution. Employing both a developmental–constructivistic and a systemic perspective, it offers a framework for identifying the primary cause of conflicts in all human systems and offers practical tools for resolving them. This book represents more than 20 years of leading edge research from two psychologists who have tested their approach with individuals, couples, families, schools, churches, businesses and non-profit organizations, communities and national and international groups. The Partnership Way addresses the causes of three kinds of conflicts in all human systems: wants and needs, values and beliefs, and intractable conflicts. Its four-stage developmental model describes the essential processes necessary for human consciousness to evolve and connects intractable conflicts with unrecognized and unhealed developmental traumas. 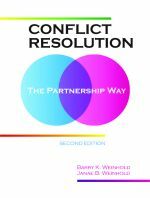 Finally, the book shows readers and instructors how to develop a personalized approach to resolving conflicts. It includes an outline for developing of a personal theory of conflict resolution.